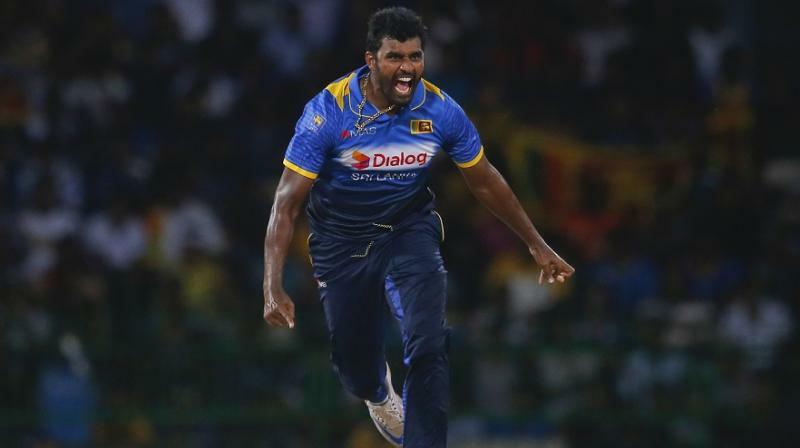 New Delhi, Nov 29: All-rounder Thisara Perera was on Wednesday named Sri Lanka's limited overs skipper, making him the seventh player to lead the islanders across different formats in 2017. Perera, who had led the depleted T20I side against Pakistan in Lahore last month, will lead the ODI team for the very first time during the three-match 50-over rubber against India. The 28-year-old will take over from opening batsman Upul Tharanga under whom the Sri Lankans suffered three 5-0 whitewashes against India, South Africa and Pakistan this year. Wishing the new skipper, Sri Lanka legend Mahela Jayawardene said on Twitter: "Wishing SLC new captain @PereraThisara all the very best..Come on panda." Earlier, Tharanga had replaced Angelo Matthews, who stepped down from the position after the islanders lost an ODI series for the first time to Zimbabwe. Sri Lanka Cricket (SLC), however, is yet to confirm Perera's tenure at the helm, which begins with the India series, starting December 10. Thisara is the seventh man to captain Sri Lanka in 2017, following Mathews, Lasith Malinga, Rangana Herath, Dinesh Chandimal and Chamara Kapugedera who have borne the responsibility in one format or other.